Incoterms are internationally accepted commercial terms defining the respective roles of the buyer and seller in the arrangement of transportation and other responsibilities and clarify when the ownership of the merchandise takes place. They are used in conjunction with a sales agreement or other method of transacting the sale. Title and risk pass to buyer including payment of all transportation cost from the seller’s door. Used for any mode of transportation. 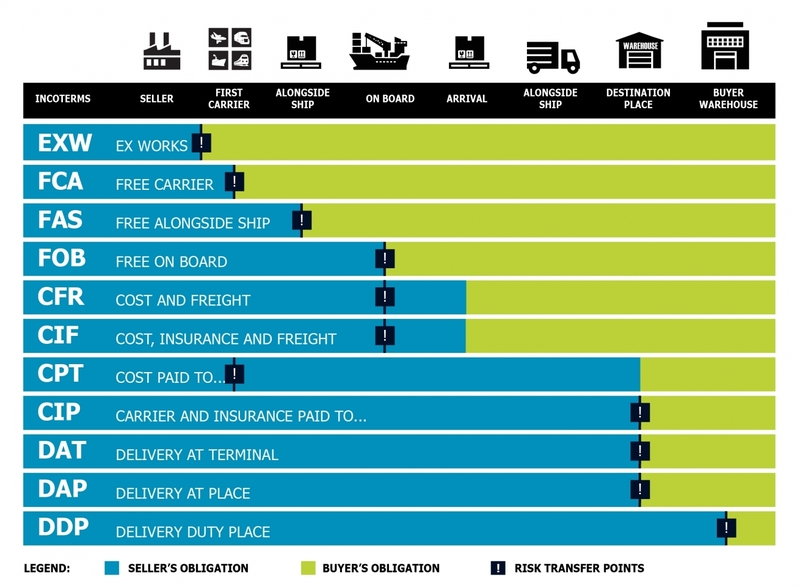 Title and risk pass to buyer including transportation cost when the seller delivers goods cleared for export to the carrier. Seller is obligated to load the goods on the Buyer’s collecting vehicle. Title and risk pass to buyer including payment of all transportation once delivered alongside ship by the seller. Used for sea or inland waterway transportation. The export clearance obligation rests with the seller. Free On Board and risk pass to buyer including payment of all transportation cost once delivered on board the ship by the seller. Used for sea or inland waterway transportation. Title and risk pass to buyer when delivered on board the ship by seller who pays transportation and insurance cost to destination port.Used for sea or inland waterway transportation.